Don't overlook the importance of good deck lighting when planning or upgrading your deck. When we recently rebuilt our second story deck we installed lights in the soffits on lower deck and it is a great space now during the day and night. Installing the proper lighting on your deck or patio will make your deck stand out at night and make it more enjoyable for yourself and your guests. Good deck lighting brightens tricky areas such as steps or walkways and showcases your deck to its best advantage at night without blinding you when seated or moving around on your deck. Accent Deck Lighting is similar to the sconces used often indoors. The light fixture mounts to posts or walls, steps and railings, spreads the light downwards. It is the perfect lighting style illuminate the edges of decks and steps. Postcap Lighting mounts on posts and projects light projects 360 degrees around the fixture, making it a perfect accent for marking the entrance to a deck or flight of steps. Pathway Lights mount to posts on stairs, railings and in the garden to illuminate walkways. In-Deck Lighting Disks mount flush to the deck floor boards. You can tread on these lights without damaging the fixture. These lights are ideal for lighting the perimeter of decks and docks. These lights come as disks or bricks. Solar Deck Lighting is the easiest no-wires way to add outdoor lighting to your deck and landscape. A solor panel built into the light fixture collects the energy from the sun during the day and charges a battery. When the sun goes down, turns the lights on. Simple! 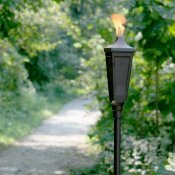 Tiki Torches are free-standing or mounted torches that use oil, propane or natural gas. They definitely have atmosphere and you can easily move them around. Most deck lighting available today is low voltage. Low voltage lighting reduces household current from 120 volts to 12 volts and can usually be installed without an electrician. With the 12 volt outdoor light fixtures comes a 12 volt digital transformer with built-in photocell that automatically turns the lighting on at dusk and off at dawn. Additional settings allow lights to automatically turn on and then off in 4, 6 or 8 hours.